For up to 6 people: Two air mattresses are available for more than 4 people. BUT please note: For six people, the apartment is a bit small. But also economic. Suitable for young people or families with children. Safe building with elevator. Security and doorman service around the clock. There is no garage in the building. Living room with sea view. Sofa-bed for 2 persons. Ceiling fan. Cable TV ( 32``, HD ). DVD. Wi-Fi. Val is a very good guest. He left the apartment in perfect conditions. Manfred was so good to deal with, he was extremely helpful and responsive in all of our dealings. 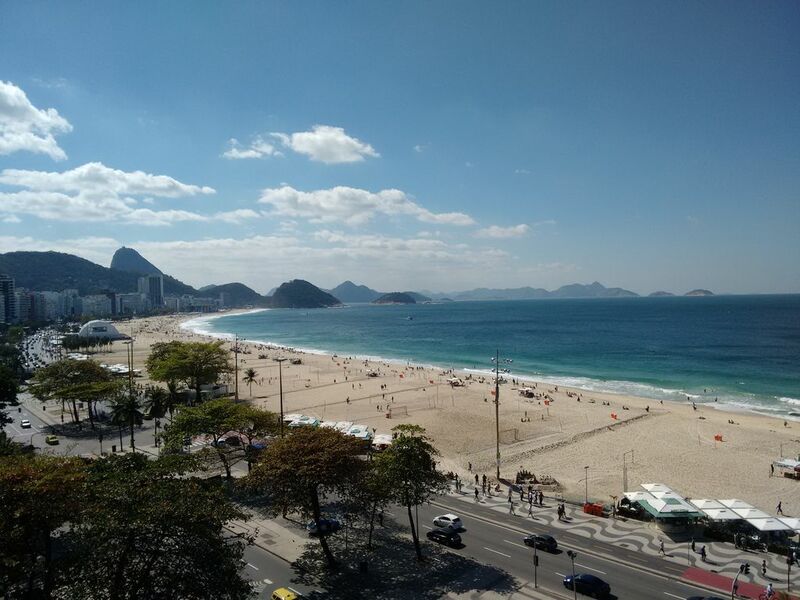 The apartment location can not be beaten for Copacabana Beach, the view is exactly as you see on this picture. It is located in a nice building and the door staff are very friendly and helpful. The apartment is not big, but when you are in Rio (especially in Summer) you dont want to be spending too much time in doors there is so much to see and do outside!! Thanks Manfred, speak to you on our next trip to Rio!! Terrible , Outdated and needs alot of remodeling. The worst place I ever stayed in my 10 years coming to Rio de Janerio. This place has a a view that is awesome, but the inside is a mess. Dirty filthy walls, mold in the bathroom , the floor feels like your walking on worn cement, dirty soiled mattress in plain view , broken cabinets/ with no doors and all the furniture was outdated. If you stay here you will be highly upset..... Stay away until he fixes the problems in this terrible place. A nossa estadia foi ótima. Muito bom atendimento do porteiro, sendo ele muito solicito, o imóvel é super simples, sem qualquer luxo, mas é exatamente conforme exposto nas fotos e a vista é linda, com tudo perto! No dia do checkout o Senhor Manfred foi nos conhecer! Foi um querido! Super atencioso! Recomendo. A otima localizaçao e a vista privilegiada é um encanto. Ficamos 10 dias no periodo de Carnaval e a infraestrutura foi ideal para nos 3. Mercado, banco, farmacia 3 min a pé. Encontramos o imovel limpo e com roupas de cama organizadas como combinado. Manfred muito gentil, nos permitiu entrar mais cedo e esteve sempre a disposiçao para perguntas e qualquer ajuda. O porteiro Simão é um encanto. Super de confiança, nos deixou muito a vontade e transmitiu segurança. Super recomendo e voltaremos com certeza! In the neighbourhood there are famous hotels as the Rio Othon Palace, the Pestana Rio Atlântica, the Sofitel and the JW Marriott Hotel. Very close to lot`s of shops, nightlife, bars and restaurants, churches, banks, gym, supermarkets, bakeries, cinema, pharmacies and major public transport facilities. Near to the metro station Cantagallo. Agua, luz e gás incluídas nos preços. OBSERVAÇÕES: Tarifas sujeitas a alterações sem aviso prévio. Maiores os períodos (13 diárias ou mais) ->>> menores as tarifas. Check-in: 15 horas / Check-out: 11 horas Limpeza inicial e ao final da estadia já incluídas no preço.